Last night Redland City Mayor Cr Karen Williams and Redland City Council Chief Executive Officer Bill Lyon took part in in the annual St Vincent de Paul CEO Sleep-Out, raising more than $4,400 for homeless. The Redland Mayor and CEO joined other business and community leaders to raise awareness and important funds in support of essential homeless services across the country. In the lead-up to the event, Cr Williams and Mr Lyon undertook a dare campaign to raise extra funds towards the cause. Residents could ‘dare the Mayor and CEO’ to take on challenges including early morning swims, bike ride challenges and donning dreaded ‘Blues’ Origin jerseys and wigs. Cr Williams raised more than $2900, while Mr Lyon raised $1500 towards supporting homeless programs. 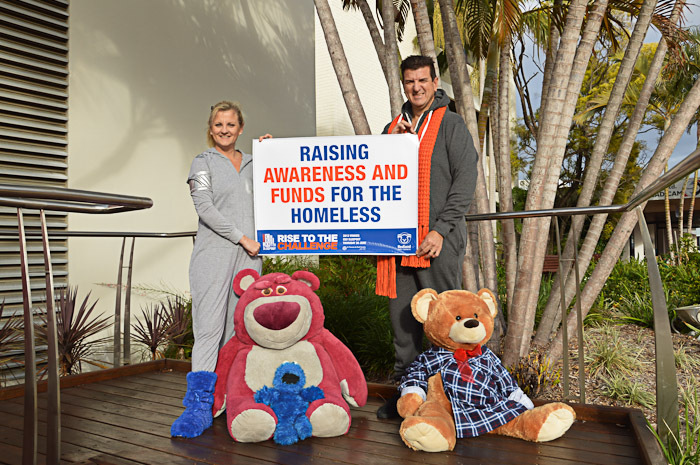 Redland City Council staff donated more than $1100 towards Cr Williams’ total, holding a ‘go comfy for a cause’ day to raise funds, with staff donning pyjamas in the office for a donation. Collectively, the St Vincent de Paul CEO Sleep-Out raised $732,000 in Queensland alone. Cr Williams said the event was a humbling experience. “Our overnight stay on a cold piece of cardboard drove home that there are many people less fortunate than us – people who are homeless through no fault of their own, and people who daily do it tough,” Cr Williams said. Mr Lyon said the money raised would help St Vincent de Paul offer essential services to people most at need. “After one rough night, I will go home tonight but sadly too many others do not have that opportunity,” Mr Lyon said. There are more than 100,000 Australians who find themselves homeless each night of the year. Just under half of these are women and a quarter are under the age of 18. The Redlands is not immune from homelessness with people sleeping rough and couch surfing. More than 1000 people in our city fall under the ‘disadvantaged’ socio-economic group. Posted in Community and tagged charity.